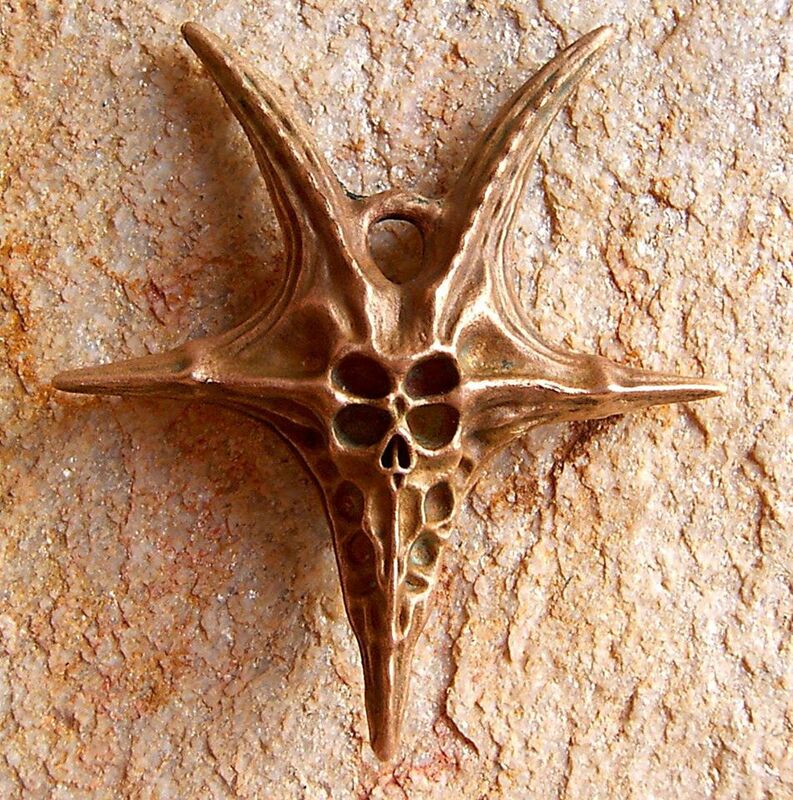 Artist Michael Schulz is the man behind this intriguing Hellsign amulet. 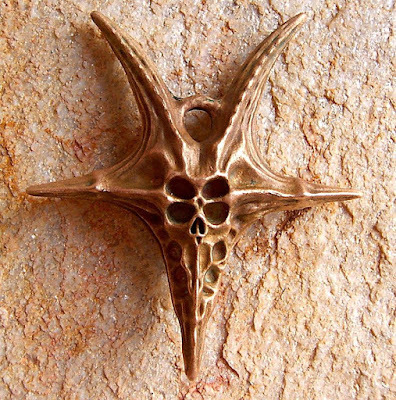 It's a a very Giger-ish spin on tradtional occult imagery, and I mean that in the very best way. 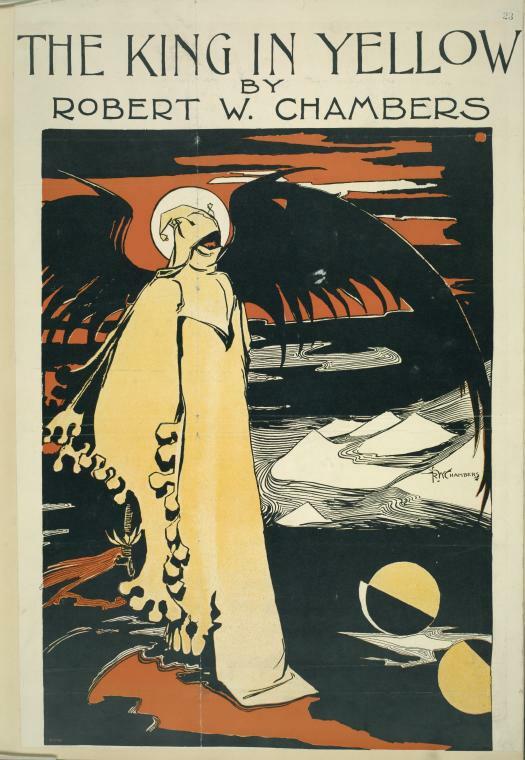 All hail the King in Yellow! This well done interpretation of the King comes to us from Andrew Wishart of "Ring and Raven Cosplay". 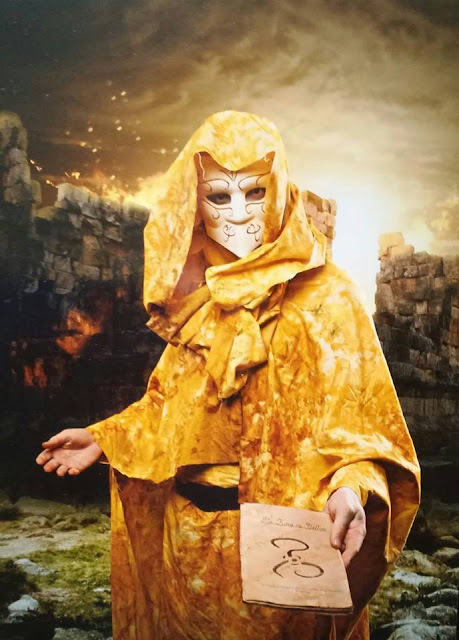 As an aside, a friend of mine came up with a brilliant take on the story-a full-blown Broadway-style production of "The King in Yellow". Bob Fosse, an incredible talent with a more than passing familiarity with dissolution and corruption, gets commissioned to develop the project around 1983 instead of working on the troubled "Big Deal". Can you imagine how awesome it would have been to have the man behind "Cabaret" and "Star 80" tackle the King? Sure, humanity would have been wiped out shortly after opening night, but it would have been glorious. Ancient Etherian is the rough Latin analogue of author E. H. Kindred's "Seven Wars" series. In addition to crafting a full grammar and syntax she created this nicely done font that would be ideal for prop use. 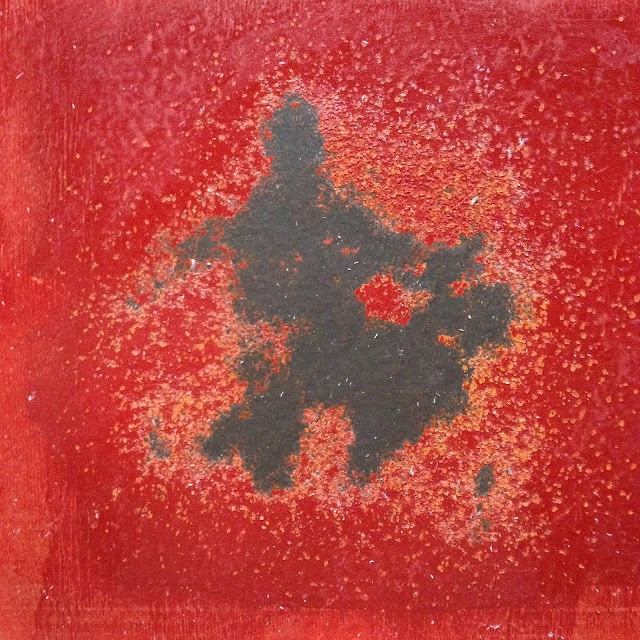 As always, I don't mean to trivialize the efforts of art-lang makers by re-purposing their work. I merely advocate the use of obscure fonts to avoid the use of glyphs the audience may be overly familiar with, what I call the "Curse of Futhark". The talented Dan Baines has launched a new gallery featuring his collection of oddities, unusual specimens, and occult artifacts. The craftsmanship on display is impressive and ranges from classic gaffs to one of a kind objets d' art. That includes what's probably the largest variety of mummified fae in a private collection anywhere on Earth. This Eastern Dragon Wand comes to us from Maylar. It's hand-carved fir with a polyurethane finish. Dave Lowe returns to our pages after a too long absence with a tutorial on recreating the look of old, rusted metal. 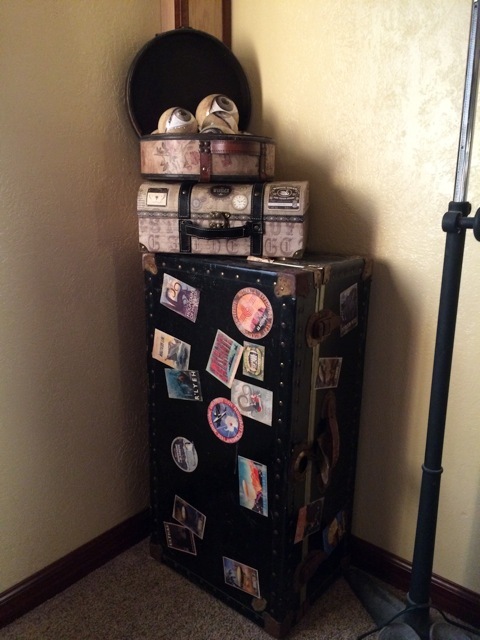 It's a relatively simple way to age any prop. 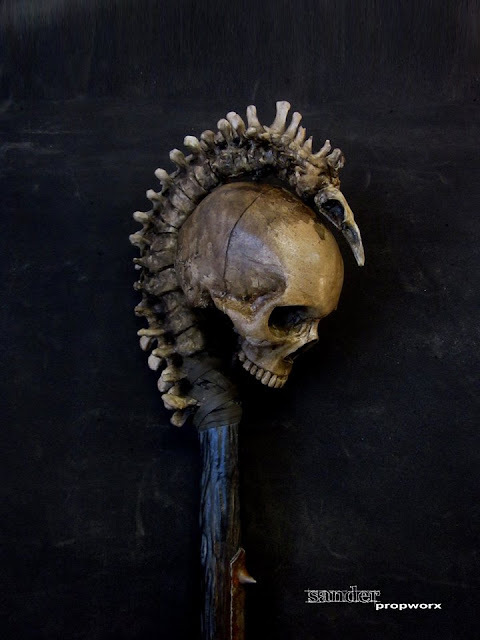 Sander Propworx returns with this wonderfully vile Necromancer's Staff. It's made from cast foam and completely safe for LARP combat. This isn't directly prop related, but artist Sergio Mengual has been posting the pieces of a Mythos-themed chess set. There are some impressive sculpts on display. All of the design work is being done digitally with a modeling program for eventual production as 3D printed masters. I shudder to think what the finished set is going to cost when it goes on sale, but I would love to get some of these as individual castings. This carved plaster Cthulhu idol comes to us from Katya's Kreatures. I love obscure prop projects. I'm always impressed by the passion that goes into making physical items drawn from movies, books, or games outside of the mainstream media universe. There are thousands of lightsabers, both mass produced and custom made, in the world. But there's only one copy of Doc Savage's machine pistol. 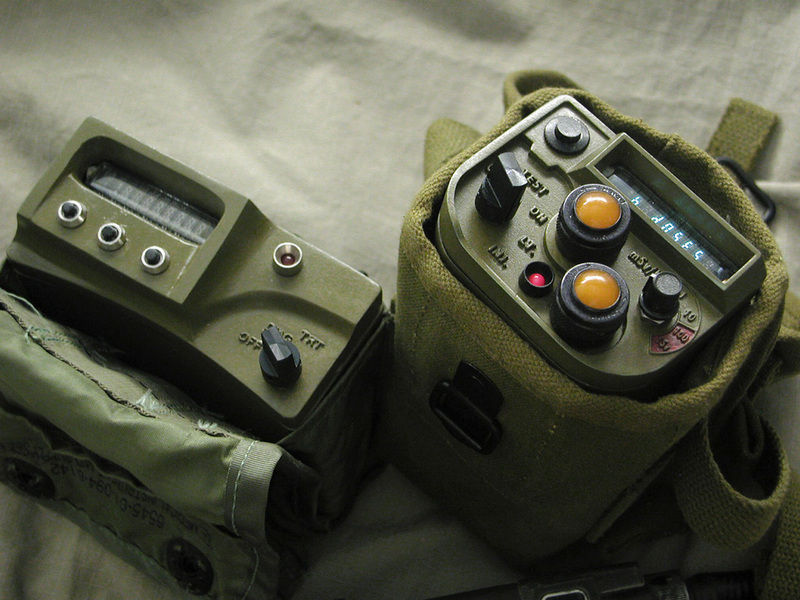 Or this set of gear from Niven's "Ringworld" stories. And how many people would spend hours creating Honor Harrington's favorite adult beverage? Mike the Mic Guy brings us another entry into that distinguished company- a CBR (Chemical, Biological, Radiological) scanner from "The Morrow Project" RPG. The game was a late 70s entry into the market that had a grittier, more realistic take on life after the apocalypse. It eschewed the goofiness of "Gamma World" and obsessive rules-making of "Aftermath! ", but never quite caught on. Ironically, the same realistic approach would turn out to be a huge success a few years down the line for "Twilight 2000". The device itself is a very high end recreation featuring 3D printed parts, lights, and a custom programmed Arduino control chip. 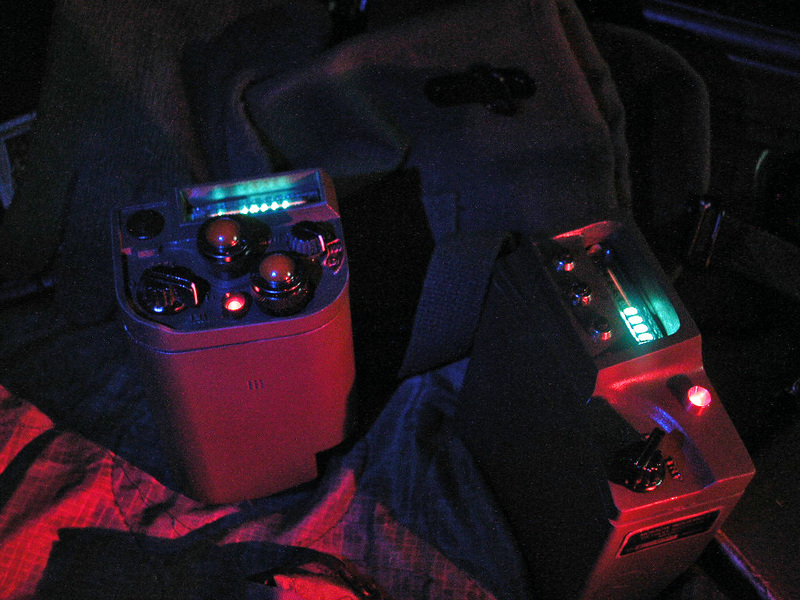 The full build log, complete with control program, is here. Follow up posts, with some nice tableau shots, are here and here. One of the most popular finishing techniques for old prop documents is burning the edge. 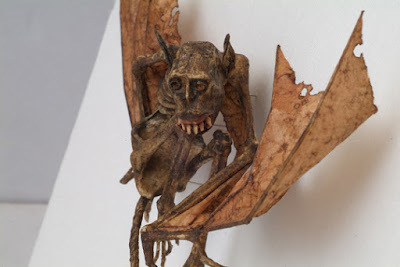 As soon as people start Googling ways to age paper they'll inevitably find it as a recommended technique. Because, you know, old documents all have burned edges. Trust me, those edges weren't burned. This is where the whole darkened edges = old document thing started, but it didn't end there. A similar process happens in paper documents. The surfaces exposed to the atmosphere darken as the wood fibers react with oxygen and airborne contaminants. There's also some wicking involved. As room humidity climbs the paper absorbs moisture. 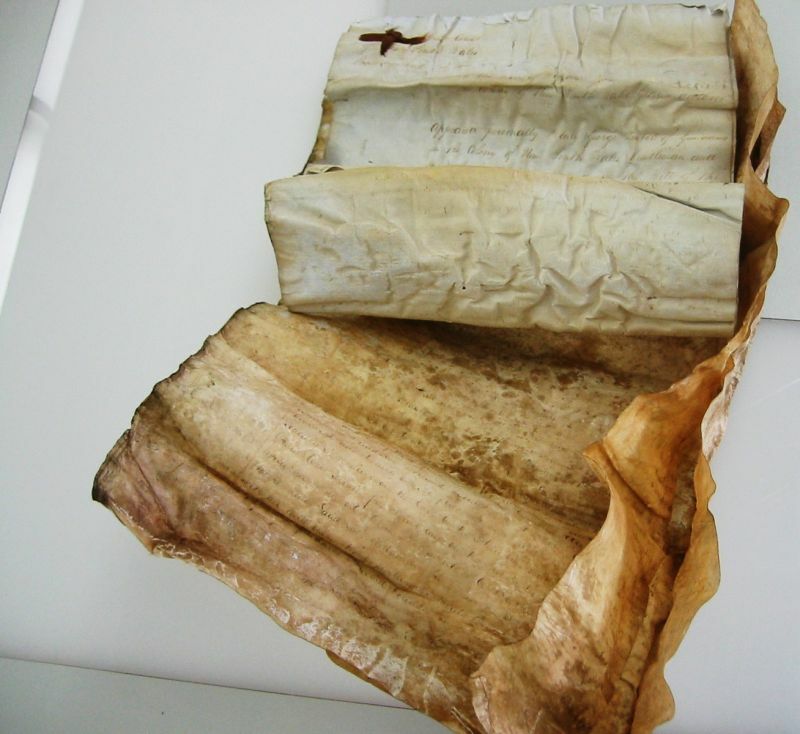 This process happens from the outside in- the exposed edges and outer sheets of a bundle of documents pick up more water. When the humidity drops the process reverses. 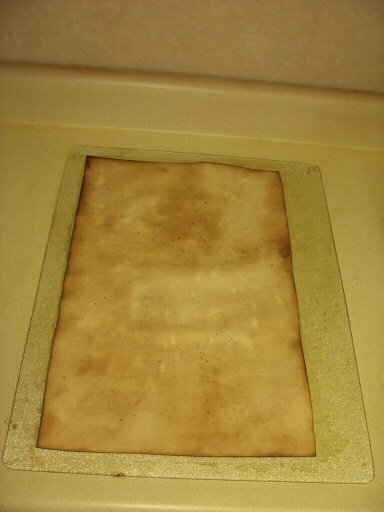 The edges and outer sheets dry first. This draws the moisture in the interior of the bundle out to the edges, bringing with it any dirt, oil, and soluble pigmentation. Tada! More edge darkening. Somehow, reproducing that look with flame has become a go-to technique. Why? 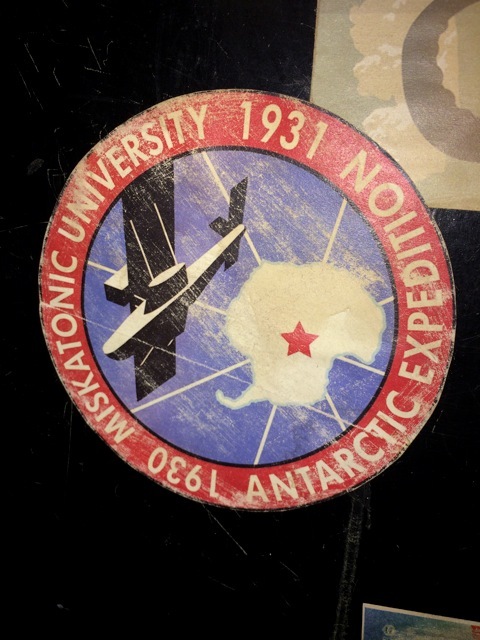 This is purely a theory, but I suspect it dates back to treasure hunts at summer camps. They're a fun way to teach kids the basics of land navigation, and theming the event with a pirate map is just the kind of thing campers love. The problem is that each team needs a map of the campsite. What's a harried camp counselor to do? Trim down one of the pre-printed maps inside the camp brochure, dip it in tea to recreate the look of parchment, and burn the edges because, you know, that's how old maps in pirate movies looked. So what's the point of this rant? Stop burning the edges of prop documents. It's dangerous, messy, and, ultimately, pointless. If you really want to reproduce the darkened edges of old paper or parchment use the slow dry technique. 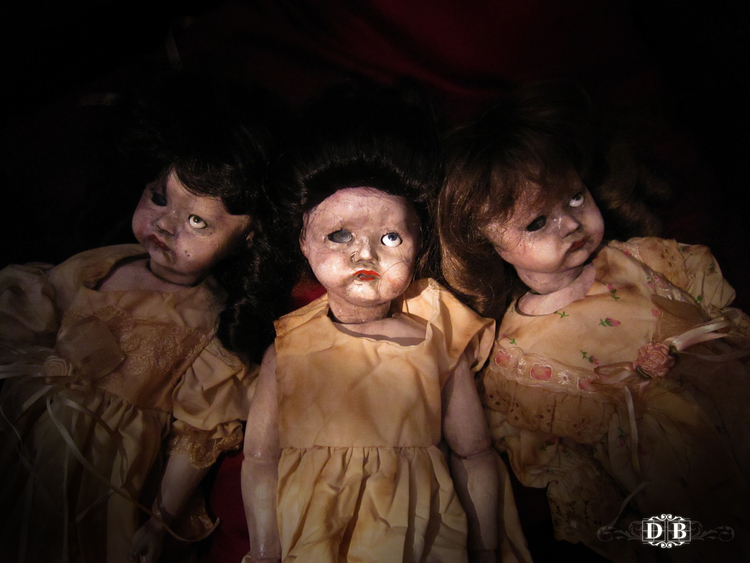 It's far more controllable, produces a realistic effect, and won't set your house on fire. And check this out for how to reproduce the look of more extreme edge wear. Cthulhu Fhtagn! Father of Monsters Edition. Father of Monsters FX brings us this unusual Cthulhu idol. 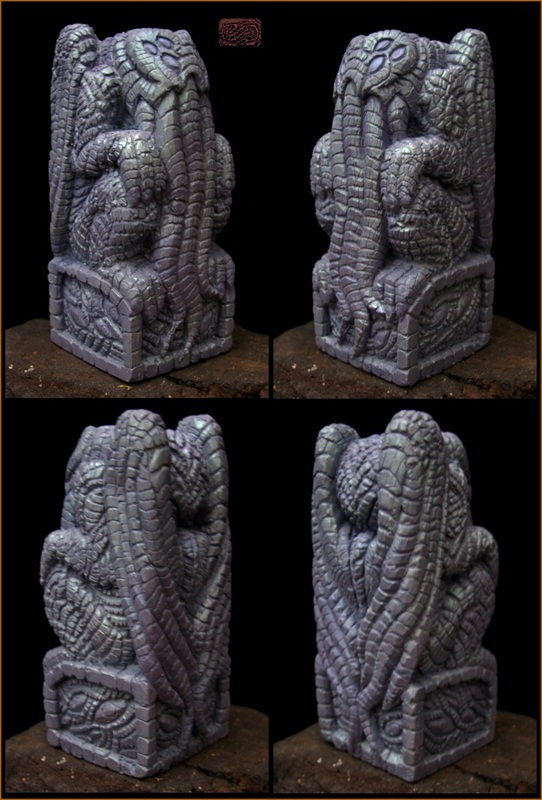 The basic form is almost identical to Lovecraft's original sketch, but the surface treatment has an interesting swirled, flowing texture. SplatterFactoryTV brings us this clever tutorial for creating prop intestines out of packing peanuts coated in latex. 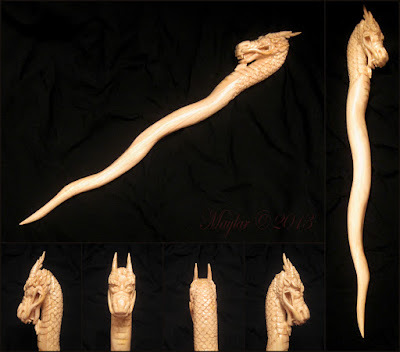 The same technique would be handy for creating all sorts of tendrils and tentacles for a costume. 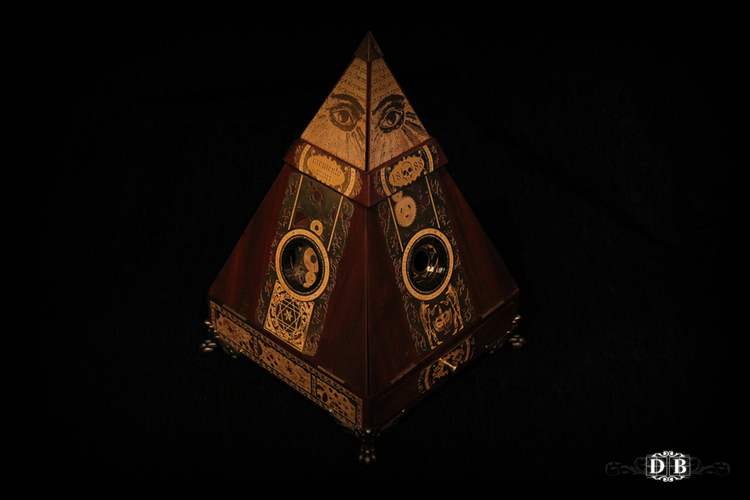 "RPFer" brings us this recreation of the Shining Trapezohedron from Lovecrafts "The Haunter of the Dark". The custom cut crystal is colored with, of all things, spray-on taillight tint. 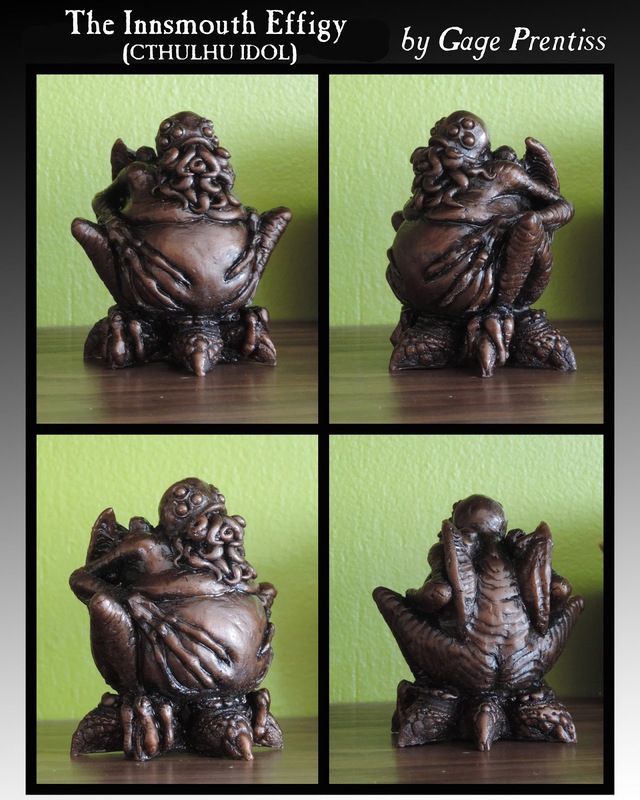 Copper Centipede returns to our pages with this scaled Cthulhu idol in a metallic lavender finish. 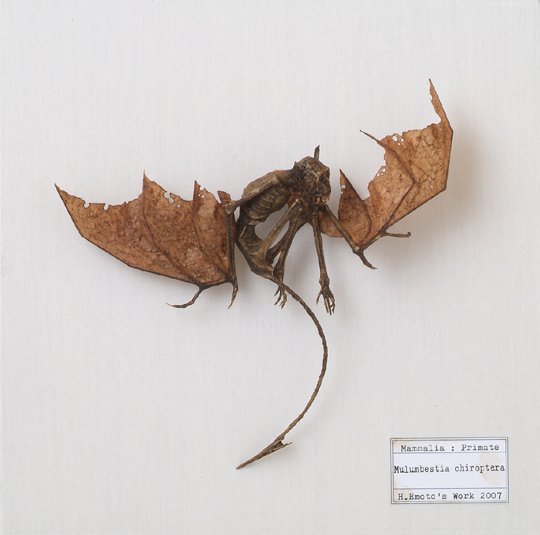 Japanese gaff artist Hajime Emoto brings us this specimen of Mulumbestia chiroptera. 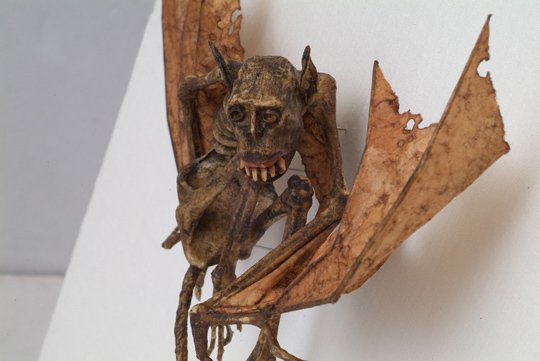 It's just one of the unusual creatures to be found at his Museum of Fantastic Specimens. 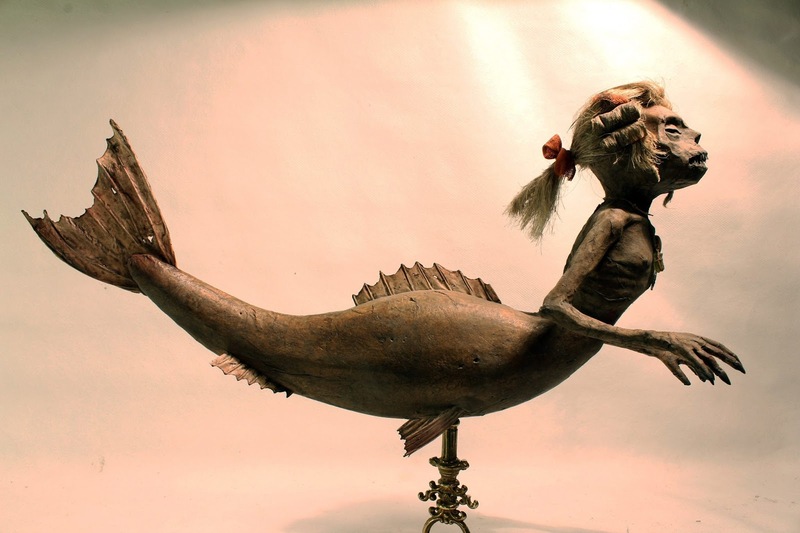 Jacob Petersson of Curiomira brings us "The Wigged Fish of Barbary", a classic-style Fiji mermaid gaff. Neale Davidson of Pixel Sagas brings us this nicely done faux-cuneiform font. 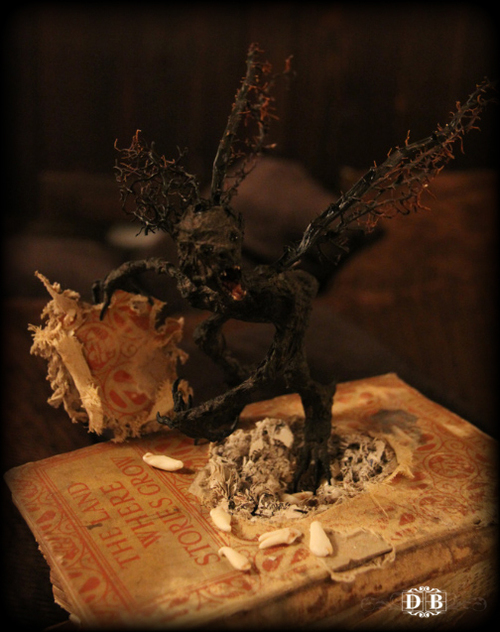 It's based on the goblin language from the "Kingdoms of Kalamar" tabletop RPG setting. This would be handy for printed props, but would be awesome for a real engraved tablet. Custom laser cutting from online shops like Ponoko is surprisingly cheap using materials like MDF and hardboard. Update: Derpa derp. The font so nice, I posted it twice. Joe Givan had a problem- some ugly pipes occupying a corner of his basement. Luckily, he had a stylish solution for covering them up. 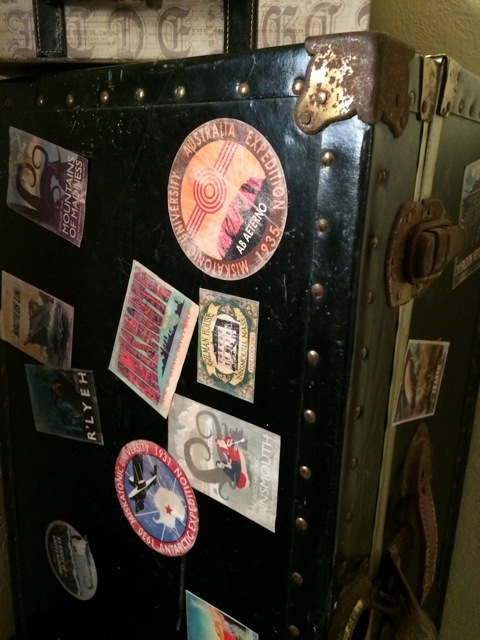 This Lovecraft Country themed travel trunk uses over a dozen Mythos-inspired luggage labels including a few of my own humble offerings. Mike Jenkins spotted this gem in the New York Public Library's digital collection- the original poster for Robert W. Chamber's "The King in Yellow". It's available as a ludicrously high resolution download. 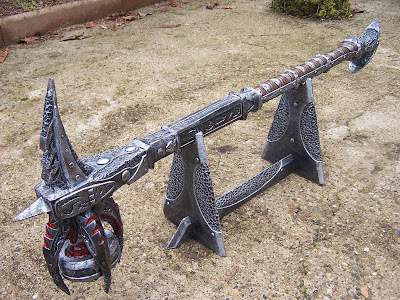 Jerome brings us this massive recreation of the Daedric warhammer from "Skyrim". 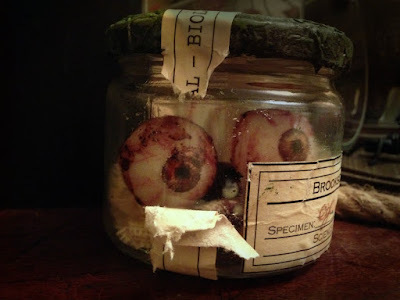 Monster Tutorials has a nifty guide on making your own specimen jar filled with preserved eyeballs. It would make a great weekend project and the final product would look fantastic sitting on your coffee table. Well, for the kind of folks that visit Propnomicon it's fantastic. Others...not so much. Heh. 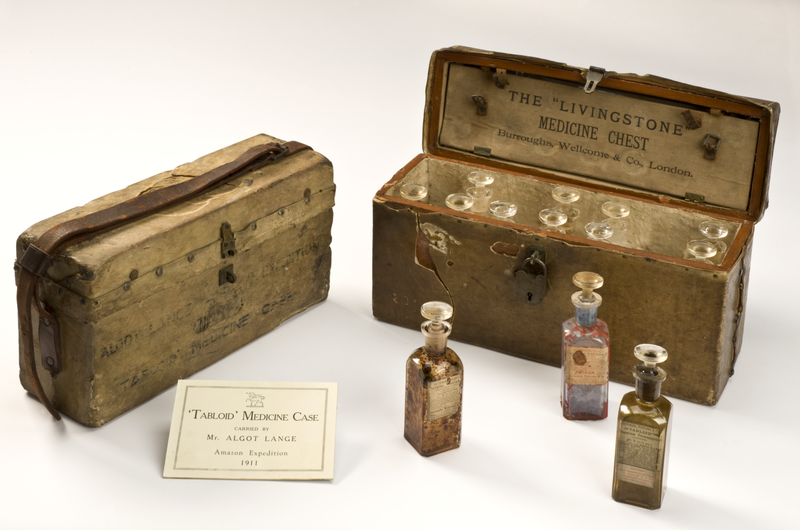 The Wellcome Trust's "History of Medicine" collection is a goldmine of classic-era goodness. This wood and cowhide medicine chest was used during an expedition to the Amazon in 1911. Compressive force from the lid kept the ground glass stoppers tightly sealed in their bottles. Expeditions to the far corners of the Earth, and the horrors found there, are a foundational part of both the Mythos and pulp adventure. If you have any interest of the actual gear and equipment used in period I would heartily recommend Stuart Edward White's "Camp and Trail" from 1906. 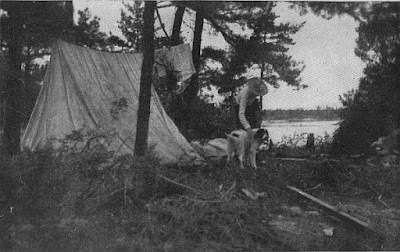 It's a well-written introduction to roaming the wilds that includes an thorough overview of vintage-era camping equipment. That includes a very detailed look at running horse and mule trains. The biggest lesson to be learned from the book is that little, if anything, has actually changed. Take a rambler from the late 1890s or early 1900s and plop him down at a trailhead today and he'd easily recognize every piece of equipment in use. The only significant innovations have been the development of artificial fibers, which cut the weight of gear significantly, and tents supported by flexible spars under tension. 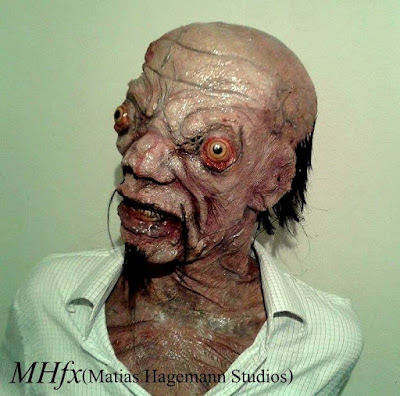 The talented Gage Prentiss is no stranger to these pages. 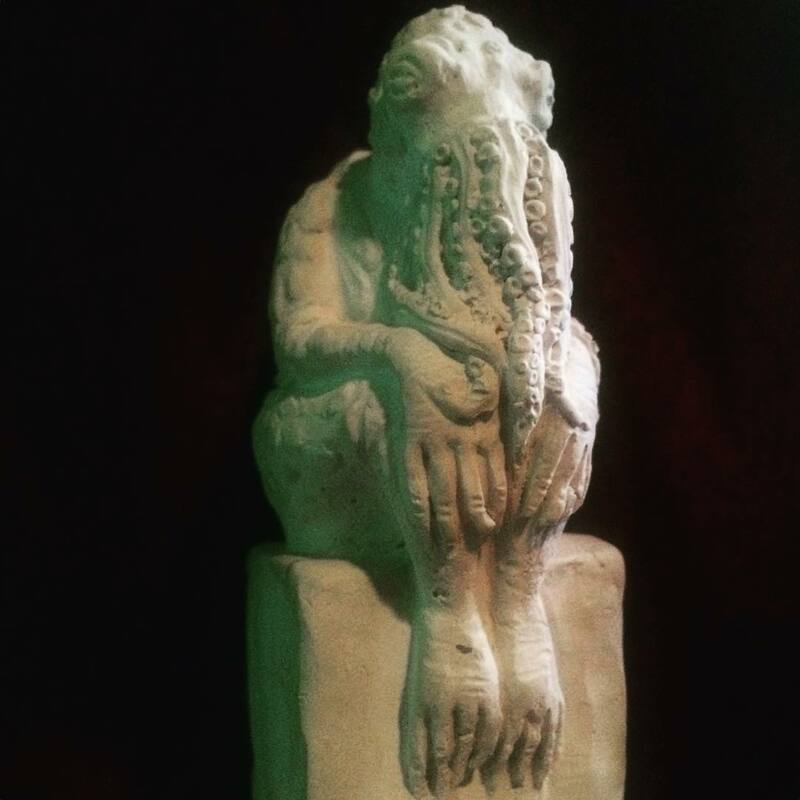 He returns with this excellent Innsmouth-inspired Cthulhu idol. 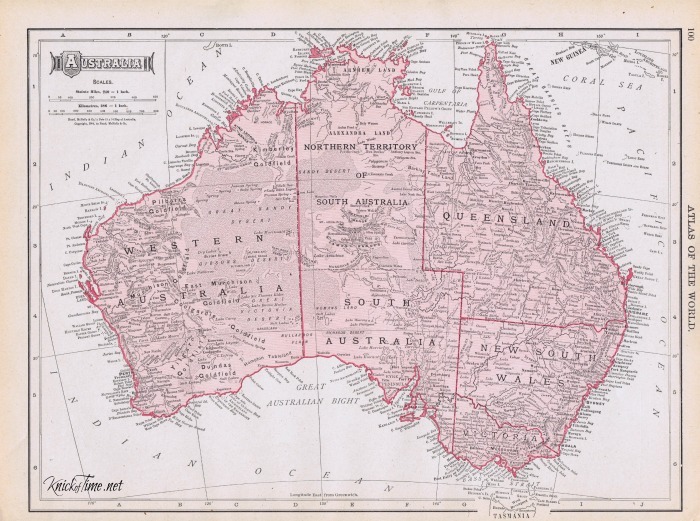 Knick of Time has this classic-era atlas map of Australia available for download. It would make a perfect handout for the Australian segment of "Masks of Nyarlathotep". I wish these were available as line artwork. They'd make awesome pages for a prop tome. 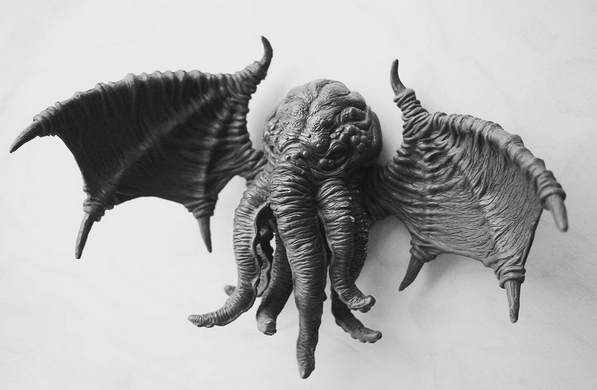 Levus3D "sculpted" Cthulhu digitally, produced a master via 3D printing, and then cast this piece in resin. Desktop manufacturing is incredibly exciting, but digital creation tools open up even more possibilities. We're not too far from being able to model a true non-Euclidean world. Just imagine exploring R'lyeh and its bizarre physics in a virtual environment. It could make for an amazing game...or the plot of a horror movie. This distinctly non-humanoid take on Cthulhu comes to us from sculptor Scibor Teleszynski. 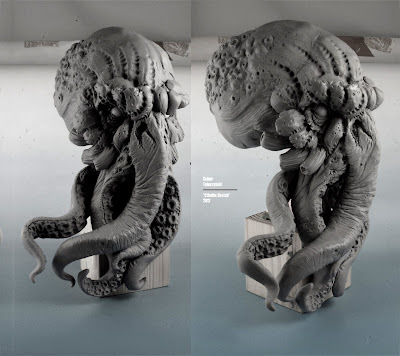 After seeing dozens hundreds of Cthulhu idols I find myself enjoying more extreme takes on Lovecraft's original concept more and more. Conveniently, it seems artists feel the same way. Rick Sardinha's African Cthulhu and Kezeff's heavily stylized art deco interpretation are good examples of sculptors building on the Old Gent's creation. This Deep One hybrid prosthetic comes to us from makeup artist Matias Hagemann.